It’s March which means those boaters who had the foresight to send in Rogue River Permit applications back in January and February will find out whether or not they were chosen. It’s March 5th now and lo and behold my wife got one! The happy news came in the mail. We did a happy dance knowing we’d get at least one rogue river trip in this summer. We called all our fellow boaters and filled them in on the great news. I know it sounds like I’m making a huge deal out of this, but for us it really is. I’ve been putting my name into the lottery since I was eighteen years old and I’ve never gotten a permit. My wife, same thing. We figured there was something conspiring against us, but now the curse is broken; our family actually got a permit. Our lack of success in the past doesn’t mean we haven’t gone down the permitted section of the Rogue, far from it, we’ve always been able to get on through cancellations, but obtaining a permit is so much easier. Now we can actually plan our trip down to the last detail. We know in March that the week of August 2nd we’ll be on the river. We can invite the people we want, plan our meals, our gear, everything. Our friends will have plenty of notice to get time off from work so we’ll have the exact crew we want to enjoy the trip. We didn’t put permits in for any other rivers, but with our luck changing, maybe next year we’ll apply for some Idaho rivers like the middle fork of the Salmon. 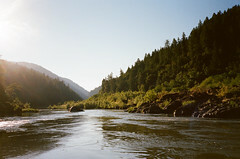 Anyway, we know where we’ll be in August: on the beautiful rogue river. Good luck to all you other boaters out there…if you haven’t heard from the Rogue lottery yet, you’re probably out of luck. Time to think about cashing in on some cancellations but don’t look at August 2nd, were not giving up our spots for anything.